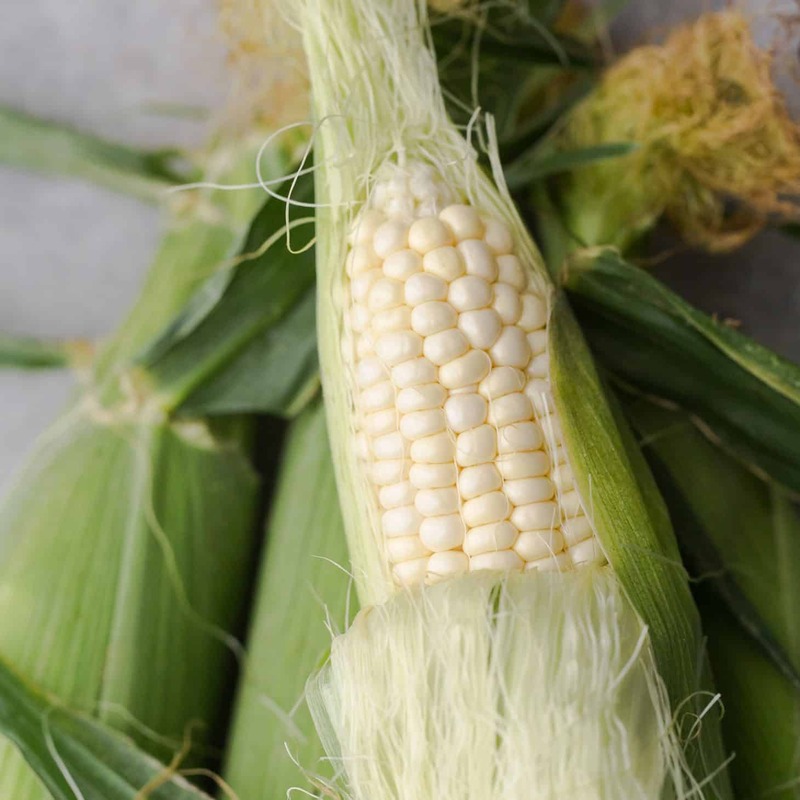 I am always disappointed when sweet corn season ends. In fact, I tend to convince myself it lasts longer than it does. Usually, by the time I get around to freezing any, it is too late. So, I’ve resigned myself to being okay with the last ears of the season (as I’ve preserved/frozen many other items) and I’m okay that this dish will probably be my last meal with fresh corn until next year. 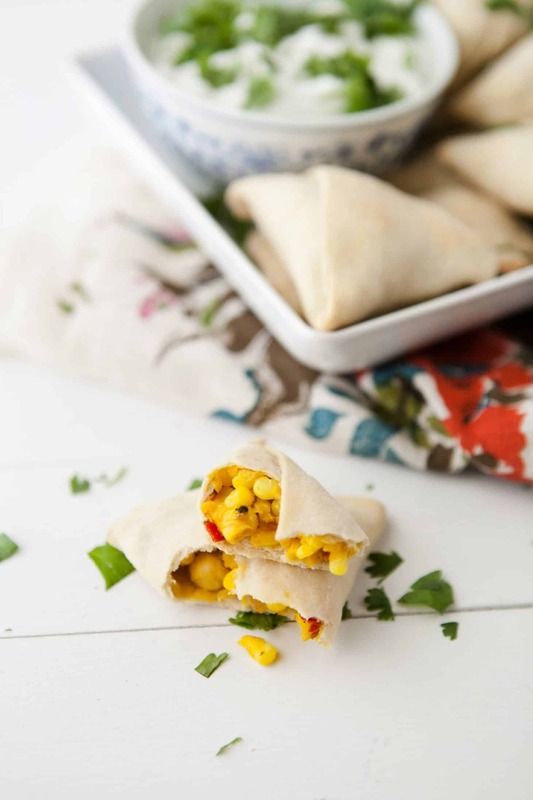 These corn samosas are the perfect way to send out the last of the summer sweet corn. Although they take a bit of work, these samosas make great party snacks and taste great hot or at room temperature. Specifically in this recipe, I was able to get two dozen, 3-bite corn samosas. Plan ahead if you need more! You can also pre-make and freeze them. 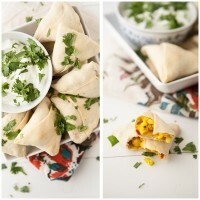 Then thaw and bake the corn samosas when you need a snack or a quick meal. In a medium bowl, combine pastry flour, salt, and baking powder. Pour in oil and 1/3 cup of water. Mix and slowly add water until dough comes together and is soft (but not sticky). Cover and let sit while you cook the ingredients. Heat a large skillet over medium heat. Add olive oil, then the diced onion and red pepper (dice these as finely as you can). Cook for 3 to 4 minutes. Next, stir in spice mixture and cook for one more minute. Add lime and corn, continuing to cook until corn has cooked through. Finally, stir in chickpeas and cook until hot. Remove mixture from heat and lightly mash to for a more consistent filling. Divide dough into 12 balls, roll out as thin as you can (while still being workable) into a circle, and slice in half. Scoop roughly two tablespoons of filling close to one end and fold over that end, aligning the circle’s edge. Lightly crimp edge. Next, fold over the other end and wrap around so that it fold over the previously wrapped side. Crimp the top together (so the filling doesn’t fall out) and place on a baking tray. Continue with remaining dough and filling. Brush with oil and bake for 35-45 minutes, until golden brown. Serve with your favorite dipping sauce (I used a lime-cilantro yogurt dip)! Tips & Tricks: If you are still confused on how to wrap it properly, I recommend searching for “samosa dough.” There are many different techniques for wrapping! Links: Samosa dough from this recipe. Peas: In place of the corn, I like to go the more traditional route of peas and potatoes. We always have frozen peas on hand, so this is a great last-minute option. Greens: This is more work in addition to the corn or other ingredients but I like to wilt kale, chard, or spinach and add to the filling. Sweet Potatoes/Squash: During the fall months, I’ll roast small cubes of sweet potato or butternut squash to include with the filling of these samosas. The flavor goes perfectly with the spices! What a lovely way to celebrate the end of corn season. These samosas are lovely. My husband was just saying last night that he was craving samosas so perhaps I will surprise him with these! I love it. Perfect for desserts. Easy to make! I’ve never tried samosas (making or eating), and I’ve been telling myself for months that I’d finally make/eat some this summer. My time is running out, and these are calling my name. They look delicious, Erin! These look fantastic. I’ve never made a dough with olive oil. It looks like yours was tender and easy to roll. I’ll have to give it a shot! Erin – I’m so thrilled that you shared this. 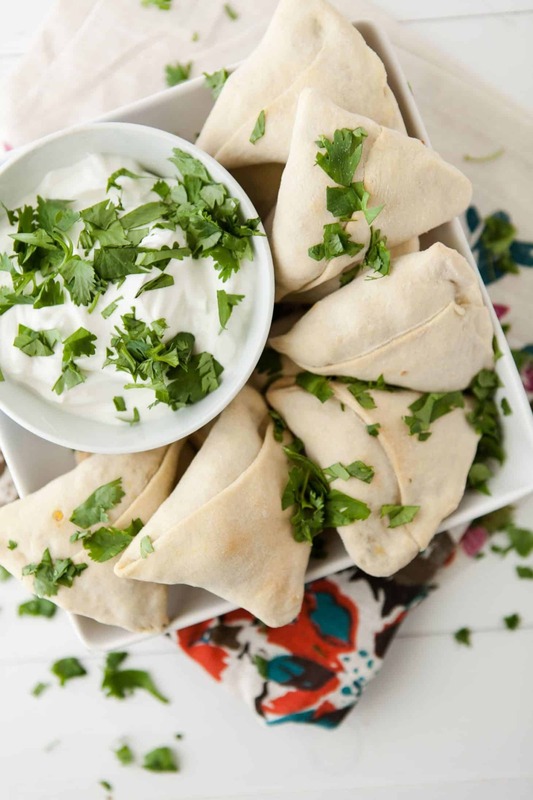 I have long been curious about how to make baked samosas, and this looks like my answer! I’m obsessed with hand-held pastries, so these instantly made me smile. And I agree with you, corn season is much too short. Even though my CSA has been gifting me at least a dozen ears for the past 3 weeks, I know that I will miss it bitterly when it’s gone. What a perfect way to celebrate the end of this glorious season– I can’t wait to make these cuties! Your samosas look fabulous, like the rest of your cooking :-). Where do you get such fine whole wheat flour without bran? Another question about your pictures: what is your source of light? The colours, including whites, are so clean and well-behaving.